"The Ends Don’t Justify the Means"
MAZE RUNNER: THE DEATH CURE is a rousing conclusion to the trilogy of stories about a group of teenagers who find themselves battling a wicked scientific organization rounding up and experimenting on teenagers to find a cure for a virus that turns people into cannibalistic zombies. The action and suspense are non-stop in MAZE RUNNER: THE DEATH CURE, which also has a strong Christian, moral worldview, but the movie has a lot of foul language and a couple apparent plot holes, plus the ending doesn’t deliver a total redemptive victory for the good guys. 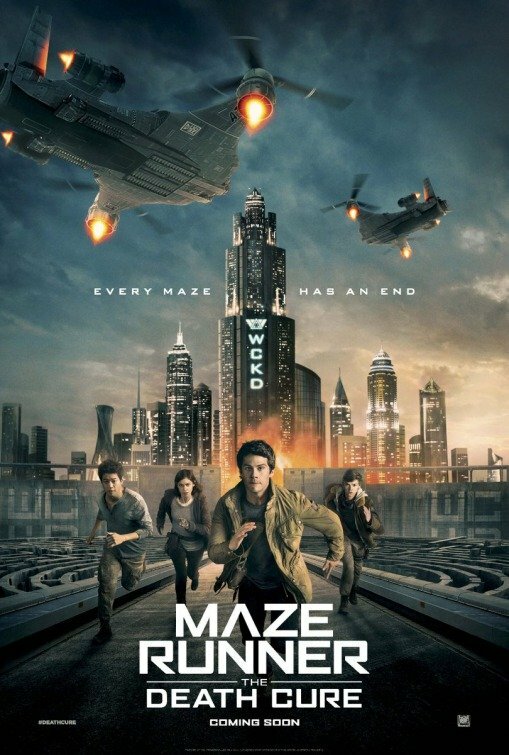 MAZE RUNNER: THE DEATH CURE is a rousing conclusion to the trilogy of stories about a group of teenagers who find themselves battling a wicked scientific organization rounding up and experimenting on teenagers to find a cure for a virus that turns people into cannibalistic zombies. The action and suspense are non-stop in MAZE RUNNER: THE DEATH CURE, which also has a strong Christian, moral worldview, but the movie has a lot of foul language and a couple apparent plot holes, plus the ending doesn’t quite deliver a totally satisfying, redemptive victory for the good guys. THE DEATH CURE opens with a spectacular action sequence where Thomas, the leader of a group of teenagers who have escaped the clutches of the villainous scientists, is trying to save a group of youths kidnapped by the evil scientists and chained in a train car. Thomas is especially trying to find and save his friend, Minha, who’s on the train, which is speeding to the final remaining urban refuge in America. After an incredibly difficult rescue, Thomas and his friends are finally able to free the teenagers trapped on the train, but the bad guys are able to take Minha. Against the advice of the oldest good guy, who’s trying to get a large boat afloat to leave the continent with scores of young people immune to the virus, Thomas decides to go to the final urban refuge. Some of his closest friends come with him, including a young man named Newt, who’s starting to succumb to the virus. At the city, Thomas and his friends discover that the group of scientists, who call themselves WCKD (or “Wicked”), have walled off the city from thousands of people. Jensen, the evil man in charge of their security, viciously keeps the masses of starving and desperate people out of the city. Thomas also discovers that Theresa, the young female scientist who betrayed him and his friends, is helping “Wicked” experiment on Minha to find a cure. Thomas devises a plan to sneak into the city and rescue Minha, but the people outside the city are ready to revolt. Moreover, they’ve amassed a lot of weapons for a final assault. The action is virtually non-stop in MAZE RUNNER: THE DEATH CURE, and the production values are top notch. The cast does a good job handling the action and the story’s various conflicts. THE DEATH CURE has a strong Christian, redemptive, moral worldview. The good guys, led by Thomas, put their lives on the line to save or help their friends. Also, the main moral message of the movie is that the ends don’t justify the means. In addition, the movie contains some other Christological metaphors. For example, the attempts to find a cure for the zombie virus focuses on finding immunities in the blood of people who have antibodies in their blood to fight the virus. Eventually, it turns out that [SPOILERS FOLLOW] Thomas may have the antidote to the virus in his own blood. However, during the action-packed third act, the filmmakers drop this possibility. Heroes die who may have been saved by the antidote, and the good guys are unable to save the whole human race, just themselves and their friends who survive. There also seem to be a couple plot holes in the movie. For example, at one point toward the end, the lead female scientist in the city says the virus has become airborne. If that is true, however, wouldn’t the good guys need to fashion a serum antidote from Thomas’ blood to save those who aren’t totally immune? Another plot hole is that the movie never seems quite clear about whether or not Thomas seems to be the only one who has total immunity from the virus. Apparently, there is a serum that staves off the virus, but it’s not 100% effective. Thus, the movie seems a little unclear about some of the details. MAZE RUNNER: THE DEATH CURE has a lot of intense action violence. In one scene, three or four people infected by the zombie virus swarm one person and it’s implied but not shown that they’re eating the person. DEATH CURE also has lots of foul language. So, MOVIEGUIDE® must advise extreme caution. Strong miscellaneous immorality such as main henchman is on a power trip and is very cruel and selfish, scientists experiment on young people immune from zombie virus that spreads rapidly to find a cure for those who’ve caught the virus, people revolt but to their own destruction, and discussions about whether the ends justify the means, but movie sides with the idea that the ends don’t justify the means. MAZE RUNNER: THE DEATH CURE is the rousing conclusion to a trilogy of science fiction movies. Thomas leads a group of young people fighting some scientists experimenting on young people to find a cure for a virus that’s turning people into cannibalistic zombies. Thomas and his friends try to rescue another friend imprisoned in a train car with other youths. They liberate the train car, but their friend has been spirited away by the scientists’ henchmen. So, Thomas and a few others follow them to the last urban refuge where the scientists plan to experiment on their friend. The action is non-stop in MAZE RUNNER: THE DEATH CURE. The production values are excellent, and the cast does a good job. The movie has a strong Christian, redemptive, moral worldview. The good guys put their lives on the line to save their friends. Also, the main moral message is that the ends don’t justify the means. However, there’s an excessive amount of foul language in MAZE RUNNER: THE DEATH CURE. Also, the ending doesn’t deliver a total redemptive victory for the good guys.